This challenge offers lot of support from fellow WIPW stitchers. Thank you All. Do visit SharonB’s blog to see other’s WIPs. We are having ten days holidays for Ramdhan. This will be spent in India, meaning stitch free ten days. This was completed with mirrors and green/gold sequins. 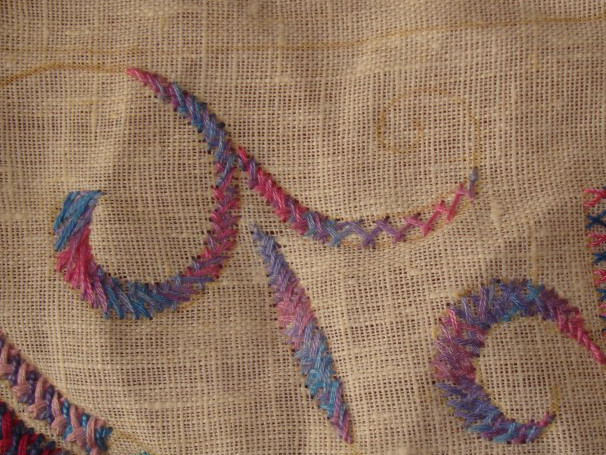 the outlines for the herringbones were done in back stitch with cone thread. 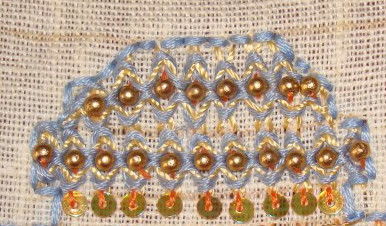 the chain stitch outline was done with fine metallic thread.The anticipation to see this embroidered border has turned to satisfaction. 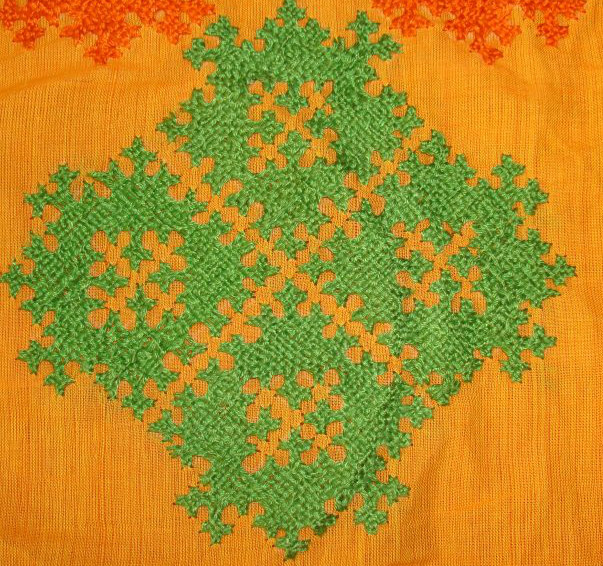 The kutch work also got some attention, with working the motif cluster in green [the border and salwar green]. It is creating too much contrast with the yellow fabric, still no further changes are waiting to happen! Time to work towards completing this project. This gives an ideas of working with two colour threads, may be in another project. Studio journal class starts from today. Hoping I‘ll have time and proper lighting to work next week. This week’s TAST stitch is still in idea stage. The last two twisted lattice bands are embellished with beads and sequins. 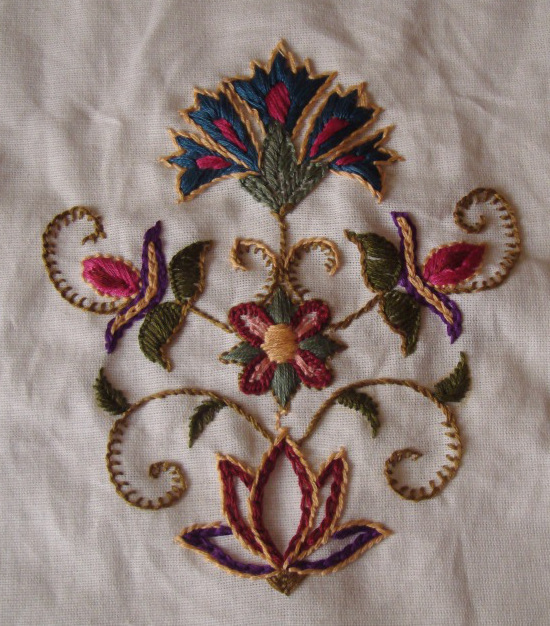 The embroidered piece was completed with this. The design started with the idea of Indian temple structures. We have so many different structures pertaining to certain regions. There was no specific temple design that inspired this piece. My husband says this looks like a crown! to give him credit some deities do have crown like this. 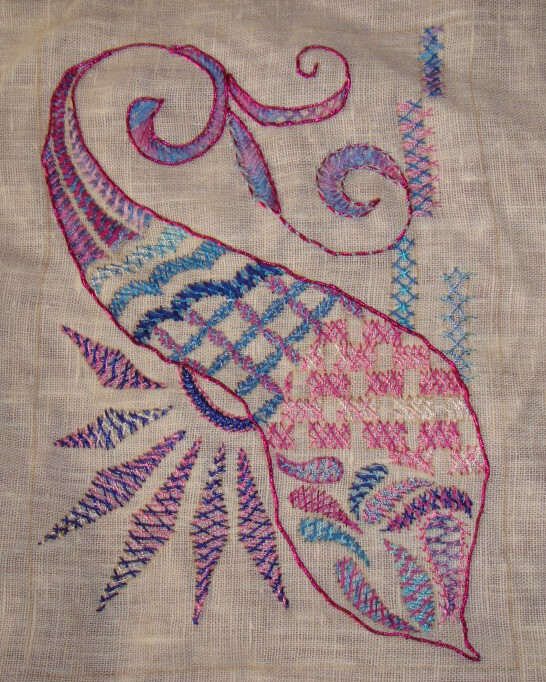 It started with applique and double herringbone stitches. Twisted lattice band was worked on these stitches. The colour inspiration was from a calendar picture. It is interesting to work other stitches in the twisted lattice band. 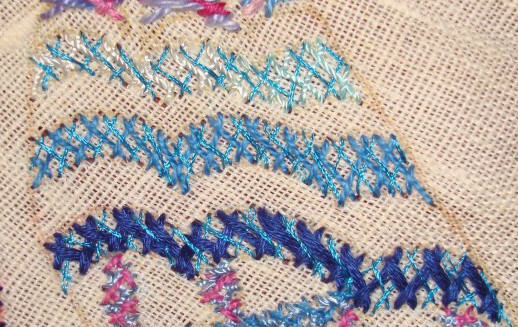 Chain stitch outline and upright crosses are worked in the twisted lattice band filling. 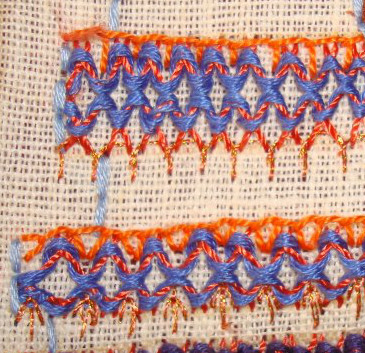 The band is whipped at the top with silk thread and two rows of arrow head stitches are worked inside the filling. 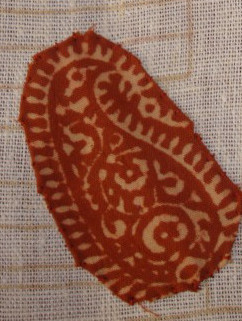 The paisley was cut out from a block printed fabric. 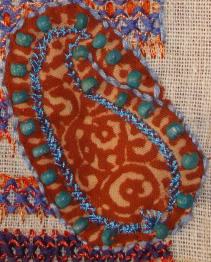 Blue wooden beads are stitched on to the paisley. These blue beads do not match the blue colour scheme, still I used them. 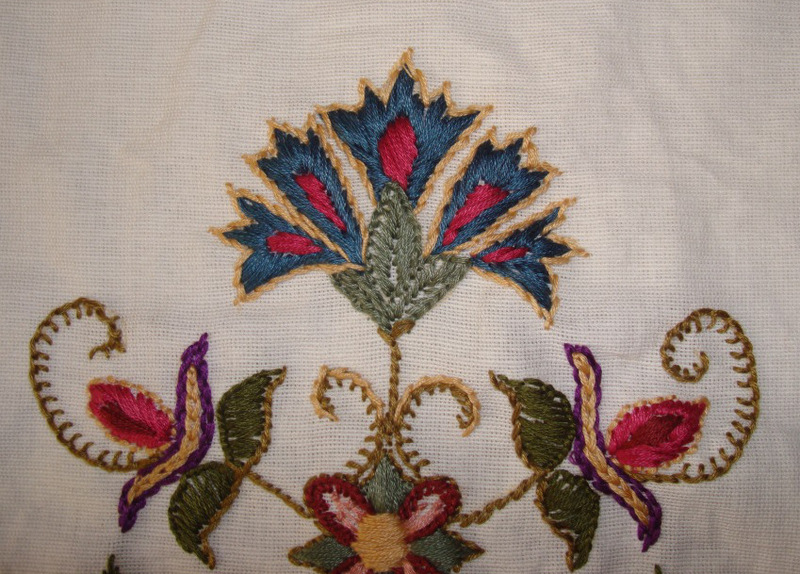 This is the last bag in the set of embroidered linen bag. 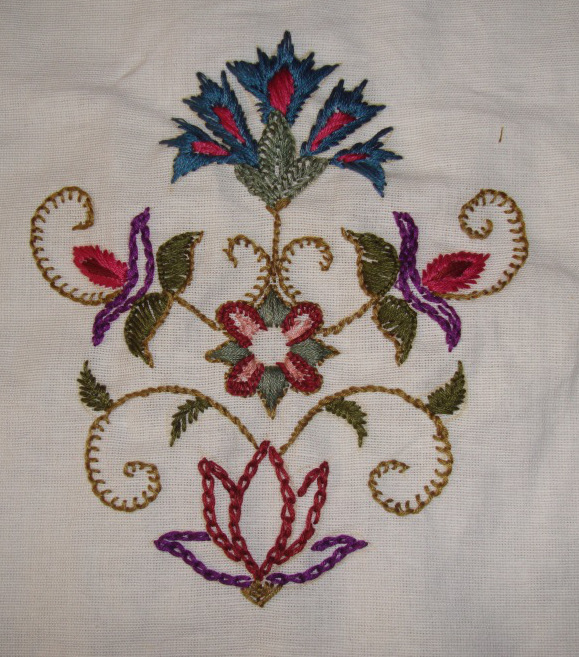 The design and embroidery has the influence of crewel embroidery. I am fascinated by the beauty of this embroidery. I love the designs, colours, stitches of this work. I have just started the journey in this enchanting world of crewel embroidery. I have to learn a lot to move further. First and foremost, I did not have crewel wool to do this work! The pattern, it is askew. After working Satin, buttonhole, chain and stem stitches in stranded cotton. 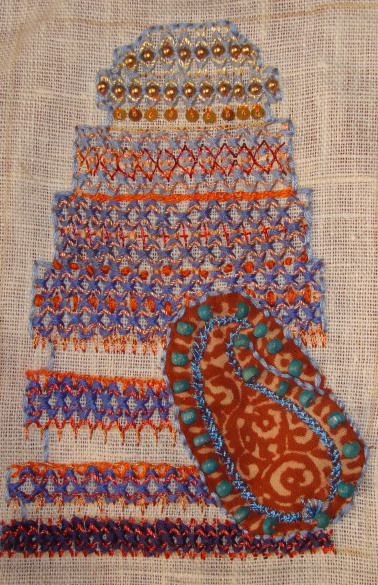 The colours for this project were inspired by antique cross stitch samplers. This bag is a favourite and was not given away. My husband also liked this bag. Next ones were monograms on satin bag. This weekly posts are helping me a lot in having a support group to work on my projects. Thank you all for your comments and encouragements. To see the work of others in this WIPW visit Pintangle. I was soaking myself with herringbone stitches to an extent that the hussif was not even seen this week. Last week’s stitch on TAST challenge was completed yesterday. How to work the next stitch is the question going around my mind presently. I have completed the herringbone stitches on the mirror work border. 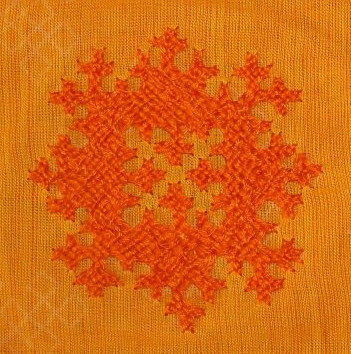 After working with yellow thread [the tunic colour], rest of the herringbone stitches were worked in orange. Straight stitches were worked in maroon thread. The tailor gave me the front piece to work the embroidery. 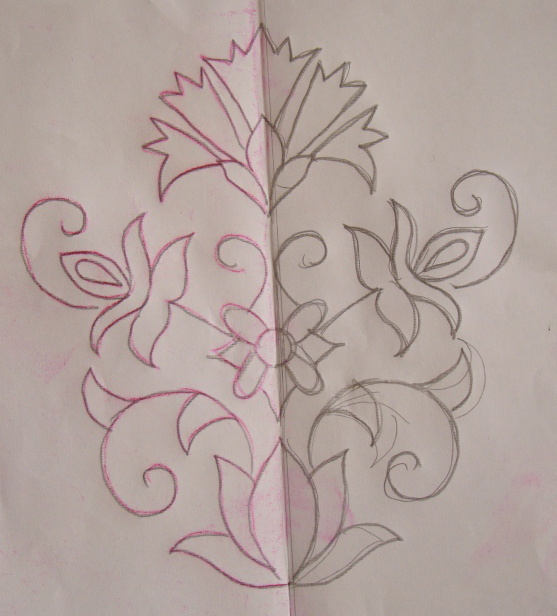 Two floral designs were drawn earlier keeping in mind this tunic, but suddenly I had this idea to work kutchwork motif. [Maybe this double herringbone stitch was causing this] Again a design was drawn on graph. It has same nine motifs arranged into a pattern. 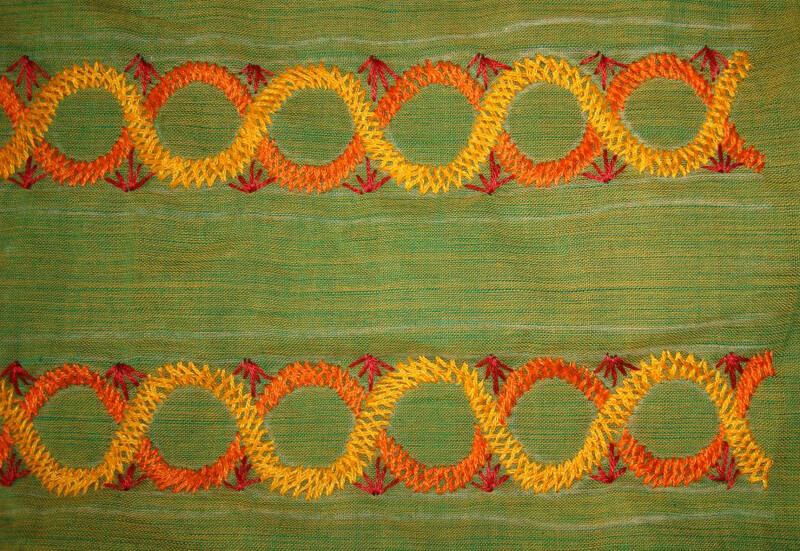 The whole kutchwork was to be done in green thread [border, salwar colour]. Feeling too much of green might be overpower, decided to add orange. 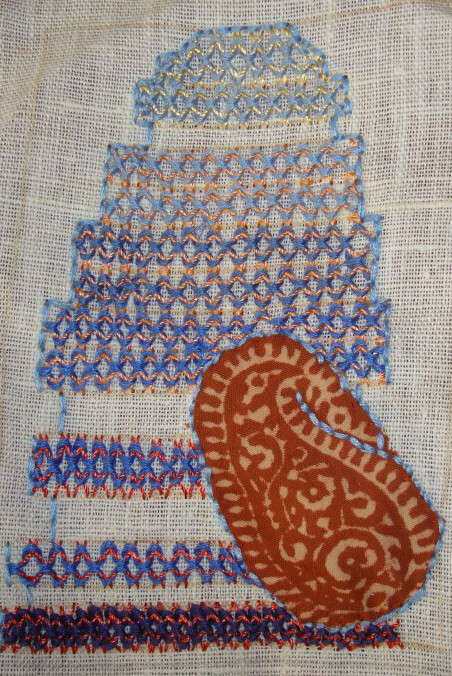 With the threads moving very closely to each other because of the weaving, this motif was a tough one. Still I had not done this for some time so thoroughly enjoyed the work. This pattern might also have mirrors. By working the kutchwork, this tunic is definitely ethnic Indian. Did I mention, sequins are going to feature along with the mirrors on the border? 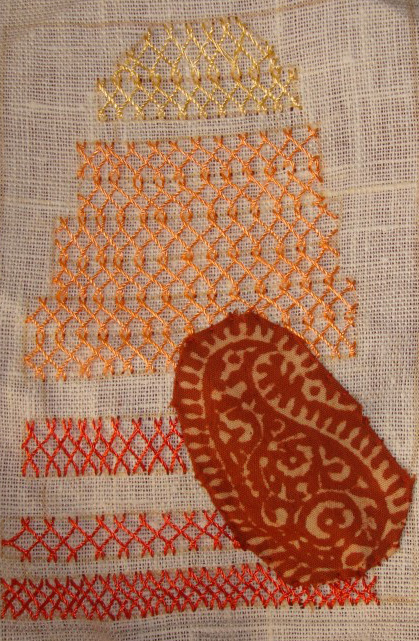 Getting back to the kutchwork motifs now. I was busy working on this piece today, last night another filling was worked in blue threads- polyester, stranded cotton, fine silk. 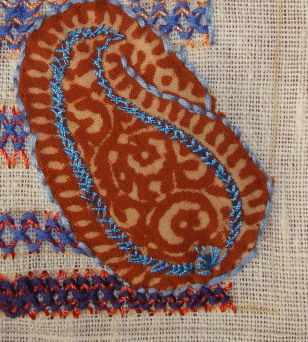 This stitch was worked as linear outside the paisley shape. 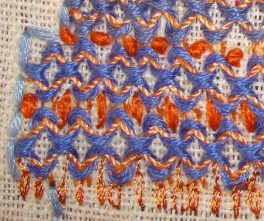 The variations are, one row is narrower than the other, one side was made wider, up right crosses were worked in the centre of this stitch row, detached chains [not clear] worked over this stitch. 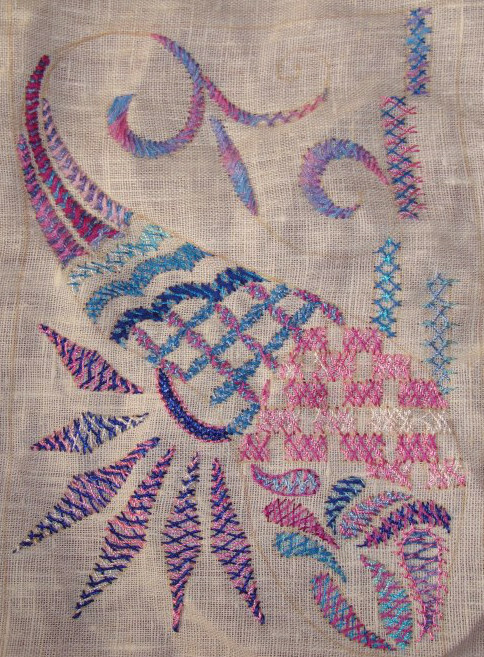 The curves were worked in blue/pink variegated thread. The paisley needed definition. Dark pink metallic thread was couched first with herringbone, seeing it was not very interesting, quitting it after some time, continued with couching stitch in the same colour stranded cotton. I felt better after working the outline. The idea was- To design this paisley shape with doodles [zentangle] and fill the doodles with this stitch. I am happy I started this design journey as a part of TAST, it seems to pull me out of my comfortable boundaries and surprisingly it is enjoyable too.